The burning Grimaldi vessel Grande America off the coast of eastern France, which caused a massive oil spill, on March 11. 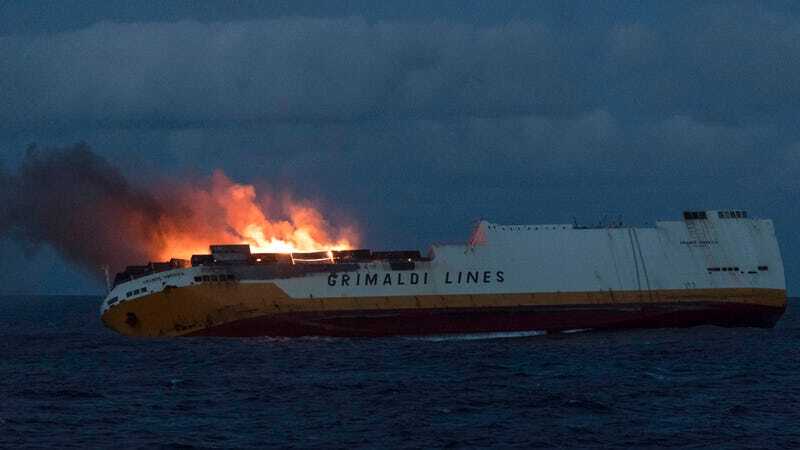 Per the Journal, major fires at sea have included the loss of the Italian carrier Grande America, which sunk in the Atlantic in the Bay of Biscay with 2,000 cars on board, causing a massive oil slick and necessitating the rescue of dozens of crew members by a British naval frigate. The blaze started on March 10 and ended two days later with the loss of the vessel; afterwards, Porsche was forced to renew production of its limited run of 911 GT2 RS cars, of which four were on board. Another blaze overtook the Japanese car carrier Sincerity Ace on New Year’s Eve while 3,500 cars were on board, resulting in five deaths. In January, other incidents included a blaze on Hapag-Lloyd’s Yantian Express off the east coast of Canada, an explosion on Vietnamese tanker Aulac Fortune near Hong Kong that killed one sailor, and a fire on the Singapore-registered APL Vancouver near Vietnam that burned for days. According to the Journal, no cause in the 2018 fire on board the Honam has been determined, but its operator, Maersk, has since banned stowing dangerous goods and those that could be difficult to extinguish if they caught fire under deck. Transport and logistics insurer TT Club told the paper they estimate approximately two-thirds of ship fires are the result of “poor practice in the overall packing process” of such dangerous cargo, which they said comprised six million containers annually or around 10 percent of all shipments. Out of those six million, 1.3 million are believed to be improperly stored or mislabeled, the Journal wrote. The National Cargo Bureau, a surveying body that assists the U.S. Coast Guard to enforce safe navigation, said 4% of 31,000 boxes it checked in 2017 contained dangerous cargo that wasn’t properly secured… Another survey of 1,700 vessel stowing plans said 20% of the plans weren’t in line with existing dangerous-goods rules. Ship Technology wrote last year that misdeclared cargo is a major issue in maritime shipping, but also noted that regulations concerning fire suppression technologies in use on cargo ships were “originally designed for smaller general cargo ships of a bygone era, and aren’t suitable for today’s megaships.” The publication noted that in particular, carbon dioxide systems used to flood cargo holds are often ineffective due to large amounts of oxygen held in containers, and that fires that move to deck are difficult to suppress. Fire detectors are also not mandated on deck, Ship Technology wrote, and on very large vessels that means crew may never see a fire before it develops into an inferno. Massive fires on huge ships also raise serious environmental concerns, as toxic chemicals and other pollutants are often dispersed over a large area. According to Hakai Magazine, owners used to beach destroyed vessels or ship them to Africa or Asia to be junked, though they are increasingly deciding to clean up and repair the vessels rather than dispose of them.